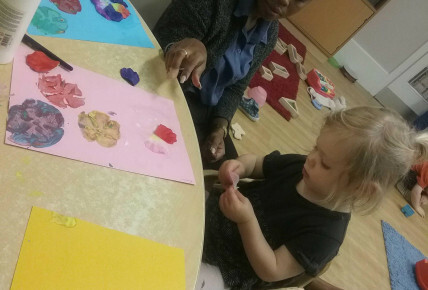 In Owls Room and Rabbits Room (1-2 years) , the children got very creative with various materials. We thought it would be nice to encourage the children to create flowers for spring. One of the staff members printed out some flowers and laid them on the table for the children to look at. 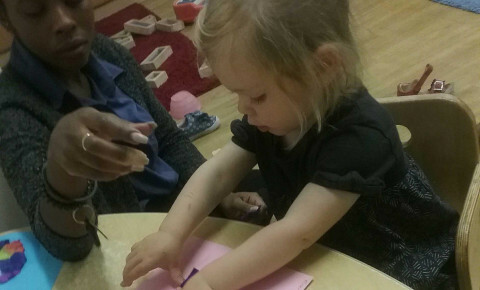 We then provided the children with flower petals, card, paint, paintbrushes, glue and stamps. We ensured this was a one to one activity for each child so they could get the most out of the activity whilst working independently. First up was Natan, he sat on the chair and picked the colour card he wanted to use. After a member of staff wrote his name on the card, he picked up the paintbrush and started dipping it in the paint. The staff member guided Natan and showed him how to paint the stamp, he done this confidently but did not want to get the paint on his fingers or clothes. After observing a member of staff stamping, he picked up the stamp and begun stamping it on the paper. He then moved to the other side of the table and begun sticking with Barbara. Barbara sat with the children and guided them whilst they stuck petals on the paper to resemble a flower. Robin picked up the paintbrush and begun spreading glue over the paper, she then grabbed a handful of petals and threw them up in the air, the other children gathered round and begun copying her. Barbara picked up a petal and stuck it on to the paper to show Robin. Robin then copied and starting sticking petals on to the paper. How does this activity support the children’s development? The children are learning multiple things throughout this activity. 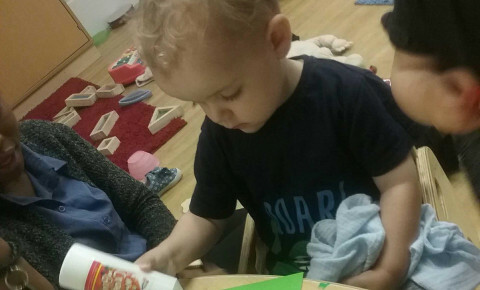 They are gaining independence when choosing which paper they would like to use and throughout the entire activity when they are having to do things by themselves. 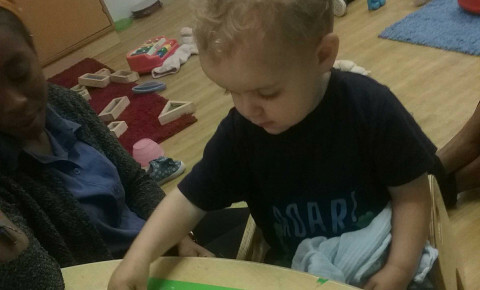 They are enhancing their Physical Development by picking up the equipment and making marks with it such as the stamps and the paintbrushes; improving their gross motor skills. In the activity we also encouraged the children to repeat the colours of the paper they wanted to use, Natan repeated Green and Vinnie repeated Blue. Doing this, supports their Mathematical Development. Broccoli Painting- Use Broccoli to print blossom trees! Flower Pots- Paint some flower pots! Leaf Sticking- Collect some leaves from outdoors and grab a piece of card. With some glue, stick the leaves on to card and create a masterpiece. Toilet Tubes- Dip toilet roll tubes in paint and start stamping away to create colourful flowers.